As planned (see Eric's Irish Red #HomeBrew), I had a brew day yesterday. It didn't go very well. It made my Worst brew day ever seem perfect. The experience of adjusting worst brew day ever was sort of fun. Yesterday was not fun at all. I drove home after the worship service at church while the rest of the family was at AHA (what our church calls Sunday School) to get the mash started. This part actually went smoothly. I overshot my strike temperature, but brought it back down just fine using ice. Pretty typical stuff. Thermodynamics to the rescue. I got back to church in plenty of time to pick up the wife and kids and got back to the brew house in plenty of time to sparge the mash. I connected the tubing from the mash tun to the brew pot, opened the value to get the first wort and NOTHING CAME OUT. Oh course, this bugs me as I thought this would not be a problem with the false bottom in the mash tun. But, this is something I've had experience with. 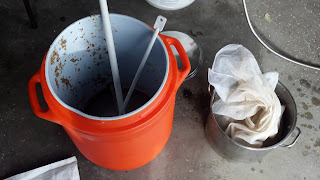 In fact because of my experience from the Worst brew day ever, I actually was experienced and pretty well prepared for handling this type of thing. 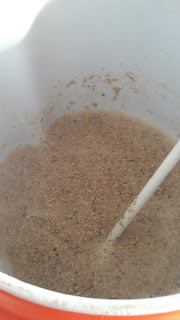 I got out my grain bag, put it in my brew pot with the sparge water, and dumped the grain in. I was a little high on the boil volume, but my specific gravity reading was almost right on, so this method was not going to affect my final beer at all. At this point, I was feeling pretty good about myself. During the boil, I got out my wort chiller and my hoses. While washing off the wort chiller, I discovered that someone must not have completely drained the wort chiller last time. This same person stores his wort chiller in the shed. The water in the chiller had frozen and broken through the copper tubing. Obviously, I was mad at myself for this. 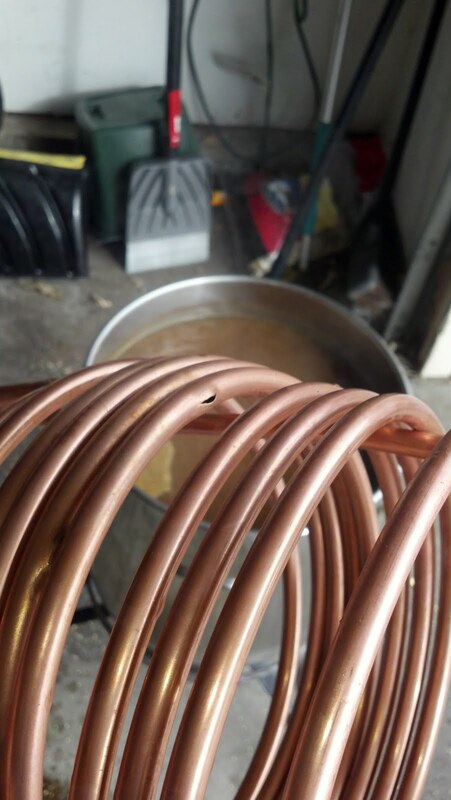 This was stupid, and would mean I would have to buy a new wort chiller, but I had a back-up homemade wort chiller. 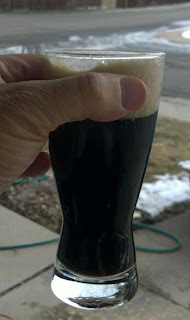 I had actually made it to be a pre-chiller, and I knew it probably would not get the wort down as far as I would want, but I figured that I could get the wort down cold enough for the carboy and then let the snow in my back-yard do the rest of the cooling. Not ideal, but workable. Well, as my home-made chiller was designed as a pre-chiller, it had never been in hot liquid. About 10 minutes into the cooling, I noticed that not much was coming out of the hose. The tubing on my home-made chiller had come undone in the pot and the cooling water was flowing right into the pot. I didn't even bother swearing at myself. At this point, I just had to laugh. I caught this problem pretty quick, but had very watered down wort. I considered just boiling off a couple of gallons of water, but decided instead to check my OG and see if I could salvage the beer as a low-alcohol session beer. My OG was right at 1.040, which is actually not bad for a session beer. I would expect it to ferment out to about a 4% ABV. Not too bad. 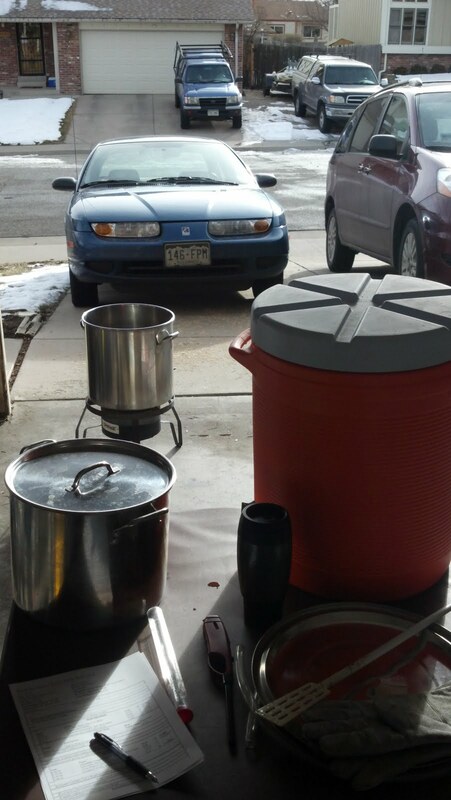 I filled up 2 of my Mr. Beer fermenters, let them cool in the backyard snow and awhile later, pitched part of my starter and a few old Mr. Beer yeast packs. Considering all the things that went wrong, I probably should have just dumped the batch. Who knows, maybe my low-alcohol session beer will be fine. The worst that can happen is that I don't like it. I can always dump it later (or give it all away). I'll let you know in a couple of weeks. In the meantime, apparently I need a new wort-chiller. I also need to talk to Jeff at my home brew shop about how to prevent grains from getting under the false bottom. I guess I'll have to brew Eric's Red again. Maybe this coming weekend. It is impossible to have 2 bad brew days in a row, but next time will go perfect, I'm sure. Fermentation was a bit slow to start, but is going pretty well now. Think main fermentation will be done today. Took a gravity reading today. 1.010 which makes this a 3.9% ABV beer. Has a nice color and the flavor is not bad. May be a bit watery, but not too bad. Bottled this up today with 4 oz sugar. Sample did taste pretty good. Still a bit watery, but I think it will be an ok beer. Tried a bomber. Like the flavor, but it is a bit watery. Probably could have used more carbonation. Better head formation and retention than I expected. Actually has nice lacing.